You are here: Home / Tech in Plain English / What are Online Cloud and Offsite Backup Services? An Offsite Backup is any copy of data that is stored in a distinctly different location from the site of the original data. The specific term “Online” usually refers to a Backup Service or Storage Location for the Backup that is available via an Internet connection on a 24/7/365 Basis. The critical thing to note it that Offsite storage of any version of a relatively current backup is a requirement of a good Disaster Recovery Plan. 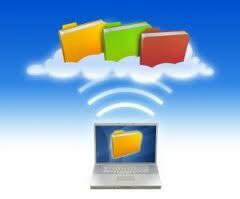 The immediate accessibility of the Backup Data and it currency, i.e. how “fresh” is the data backup in relation to the original data files is the focus of On-Line Backup Services which come in two primary flavors: Real Time with Snap-Shots – sometimes referred to as “Continuous Data Protection” and Traditional – which are on-line copies of locally created compressed backup files or copies native files themselves. In most cases, only data files, such as Word, PowerPoint, Excel, Pictures, Music (MP3/iTunes) Adobe PDF’s are copied. The files required, also known as “System State Files” to completely restore the Operating System are ignored. Many Traditional Backup Programs support the storage of an “Offsite” Copy to either the Software Manufactures site or your own Data Center, hence the term “Cloud Backup” or “Online” as the backup files go off to storage in Cyberspace. As mentioned above, many Cloud/Online Backup services focus exclusively on what would be in a “My Documents” folder and the native data files as produced by well known software applications such as Microsoft Office or Adobe Acrobat. This method and type of backup is referred to as “File-by-File” because it is no different than if one were to copy each file from the local hard drive of a computer to perhaps an External Hard Drive, USB Drive, or CD-Rom. At the Consumer/Small Business level, this is exactly the type of backup that services such as Mozy, Carbonite, Norton On-Line Backup and SOSOnlineBackup perform. In order to have a complete recovery from hard disk failure, one needs an “Image Based Backup” preferably capable of “Bare Metal Restore.” An Image Based backup takes an exact picture of the hard drive at a point in time, just like a Polaroid or Kodak photo Every single aspect of the computer is captured and frozen in time, like a photograph, and subsequently can be restored to that same exact point in time before the failure. Bare Metal Restore refers to the ability to restore the Backup Image to equipment that is empty, unformatted, and has no previously installed Operating system. This is in contrast to a “File-by-File” backup that requires a completely functioning computer or at least a fresh copy of the Operating System so that Files can be copied back to say the “My Documents” folder. For a File Server, Image Based Backup goes one step further to what is known as “Dissimilar Hardware Restore” and the ability to convert a Physical Machine Backup to a Virtual Machine Backup and vice-versa. In short, assume that an Image Based Backup is from a Vintage 2006 Dell File Server with an Intel Xeon Processor and traditional SCSI Hard Drive that is completely End-of-Life and it fails. With Dissimilar Hardware Restore capability, the Backup Image File could be restored to a brand new HP 2012 File Server with an Intel Multi-Core Processor and current generation SAS (Serial Attached SCSI) Hard Drives in a RAID Array on “Bare Metal”, or, to a VMWare VSphere/ESXi “Virtual Machine” eliminating the hardware differences completely. The Recovery/Restore Process is intelligent enough to be able to automatically reconfigure and install the required Operating System drivers so that the Server can be restored to a completely different hardware configuration – physical or virtual. In this group, Backup Software makes a local copy of Data to an External Drive and optionally has the capability to transfer a copy of the local Backup Data Set to a Remote Storage Location a.k.a. Online to “The Cloud.” Many allow copying of the files to an FTP Server (via File Transfer Protocol) which is included in many web hosting packages in which case one is limited only by the amount of on-line storage purchased. Some of the providers listed have their own Cloud Storage options available which work in tandem with the software and automatically migrate and transfer copies of the Local Backup Sets to their Company Clouds for an additional periodic service fee. For Mac/Apple users, MobileMe and iDisk have been replaced by iCloud. Click Here for More Information.